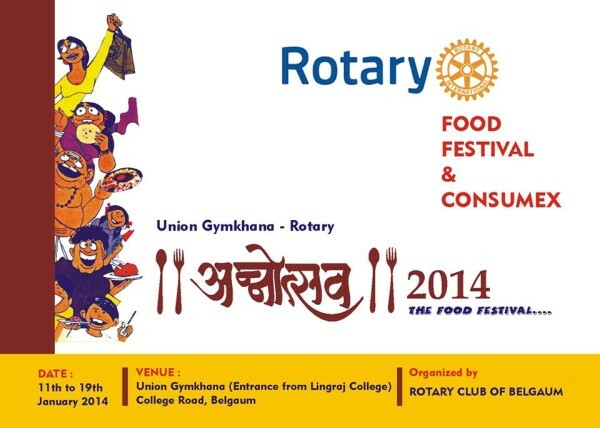 Here is an opportunity for the Belgaumites to taste varieties of food dishes all at a single location – Rotary Club of Belgaum in association with Union Gymkhana has organized nine day food festival ‘Annotsav 2014’ from January 11 to 19 at Union Gymkhana ground. 79 stalls have been installed out of which about 50 stalls serving variety of food. The funds raised from the event are utilized for various social initiatives of the Rotary club. Various cuisines Kolhapuri Tadka, Savaji, Goan Fish, Mexican, Italian and also home made food was seen at one place. Most Hotels had their stalls like Niyaz, Saffron, Laziz, Kabab Delight to name a few. The Savaji Mutton Kardu, Mutton Pickle with soup and Eradmi was scrumptious. So was the Kolhapuri Misal and the Tambda and Pandhra rassa. Fish Fry and Sea food from home made stalls was also very ambrosial. New this time to the festival is the BelChick stand where children would love to get themsleves clicked with the Live chicken puppets and also their stall. Also noteworthy were the Kake Walk and Wild Sugar counters serving some new baked products new to many. A big space has been alloted for displaying their two-wheeler and 4-wheeler vehicles. Also singing and dancing competitions, bodybuilding competition `Mr Rotary-Belgaum’ will also be conducted. The food expo will be opened from 5 pm to 10pm upto January 19.